Rahul Sinha speaking to members of a family in Pairadanga. Pairadanga, June 18: BJP National secretary Rahul Sinha today alleged that the aggressive role of the state government is largely responsible for the ongoing violent situation in the hills of Darjeeling. The former BJP Bengal president has accused Bengal chief minister Mamata Banerjee for her desperation to bring hills under Trinamul’s control as it has fueled the situation further. However, he urged chief minister Mamata Banerjee to leave her prejudices and to create a conducive atmosphere for talks so that normal public life could be restored in the Darjeeling hills. Sinha stated this to media persons during his visit to Pairadanga in connection with party’s Vistar programme. 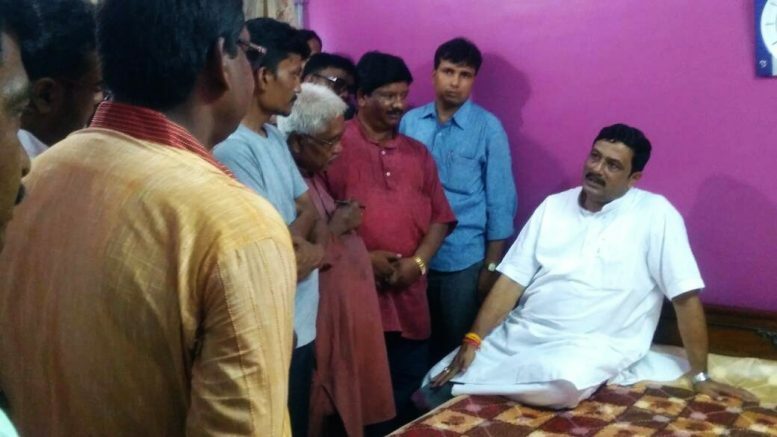 Speaking at the residence of Srikanta Choudhury, a courier service worker, where he had also lunch as part of the programme, the former president of party’s Bengal unit president said: “It is chief minister Mamata Banerjee’s desperate attempt to bring the hills under the political control of Trinamul Congress by force has unleashed the tension. The burden of “Bengali” language on the ethnic people of the hills has further aggravated the situation there”. “The state government failed to understand the pulse of the people, rather acted aggressively against them that eventually isolated from the mainstream”, Sinha added. “There was no tension in the Darjeeling hills during the past seven year. But, situation changed during the past few months as the chief minister become desperate to get control of the hills using Trinamul Congress. It was repeated mistakes on her part that include imposition of Bengali language on the ethnic people that changed the situation in the hills”, Sinha added. Sinha, however, urged the chief minister to leave her prejudices and create an atmosphere for talks with Gorkha Janamukti Morcha. Sinha said: “Chief minister should leave her aggressive attitude and call for talk to find out a solution”. “If she finds it embarrassing, the BJP can play the role of a mediator”, he added further. Sinha today visited many houses in Gopalpur-Pairadanga village near Ranaghat as part of party’s ongoing Vistar programme and appraised people about the beneficial schemes introduced by the central government.